The M30-VE series are Axis’ lowest cost outdoor dome cameras but they still come packed with great features including high quality fixed focal length lenses, attractive vandal-resistant mini dome housings, and SD card slots for on board video storage. The M3024-LVE features 720p resolution and built-in IR illumination at a cost of around $550. For the same price the M3025-VE features twice the resolution (1080p) but without the IR illumination, and finally at $650 the model M3026-VE provides an incredible 3 megapixels of resolution and can operate at light levels as low as 0.06 lux when in “night” mode. 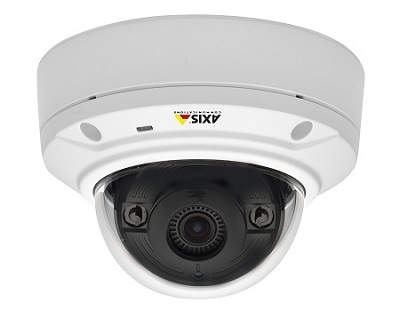 Click here to view the Axis M30-VE series camera brochure. The video below shows a clip from the M3025-VE camera. In order to view the video in full resolution, press the Play button then click on the “Settings” button (looks like a gear cog) in the bottom right corner of the video window and select “1080p”. It takes Youtube some time to shift into full 1080p streaming. You will therefore probably need to play the video through twice in order to see it at full resolution. All cameras can be set for horizontal orientation (“Axis corridor format”) where the situation requires. Lens: M3024-LVE – 2.8mm fixed focal length, resulting in a 77 degree horizontal angle of view. M3025-VE – 3.6mm fixed focal length, resulting in a 91 degree horizontal angle of view. M3026-VE – 2.0mm fixed focal length, resulting in a 106 degree horizontal angle of view. Light sensitivity: M3024-LVE & M3025-VE = 0.8 to 100,000 lux (colour), down to 0.16 lux in night mode (black & white mode). M3026-VE = 0.3 to 100,000 lux (colour), down to 0.06 lux in night mode (black & white mode).